The chances that your employees are already active on social media are fairly high. Last year a company called NetProspex produced a Social Business Report researching companies across the USA and assessing how "social" their employees were [Infographic]. Not surprisingly high-tech employees featured as high social adopters but most interesting was in the consumer space, where brand is everything, employees were much less social (in the context of social media). So what does this mean? Well, it tells some leaders that employees in B2B spend too much time on Facebook so banning social networking sites during work hours seems like a good plan. In fact over 50% of SMBs in the USA and UK still ban these sites today and it's not just the SMBs. Large organisations such as Goldman Sachs take the same approach (ironic given their recent investment in Facebook!). On the flip side, other organisations have spotted the potential. They don't give employees rules...they give them guidelines and equip them with resources to go spread the brand message far and wide. Here are my Tribal Tips for what should go in an employee social media guidelines document. I've also added some examples at the bottom. Tell employees how the organisation intends to use social media as a business tool and the purpose of the guidelines. If you're opening up the social networks for the first time, explain why you have chosen to do this. Be a person not a logo. As employees, they need to understand the importance of representing themselves rather. Social media is personal so unless the employee is managing branded channels on behalf of the business, they should declare who they are and that their views are their own. Advise employees to be mindful of what they write on social networks making sure they avoid any comments that can be interpreted as slurs or inflammatory towards the brand. Your employees should understand that companies can and will monitor employee use of social media. It's less about quantity and more about quality. Encourage employees to share experiences, thoughts and ideas in order to get the best out of social media. The more you give, the more you get back. It goes without saying that confidentiality agreements apply both offline and online. Be sure to reinforce that. 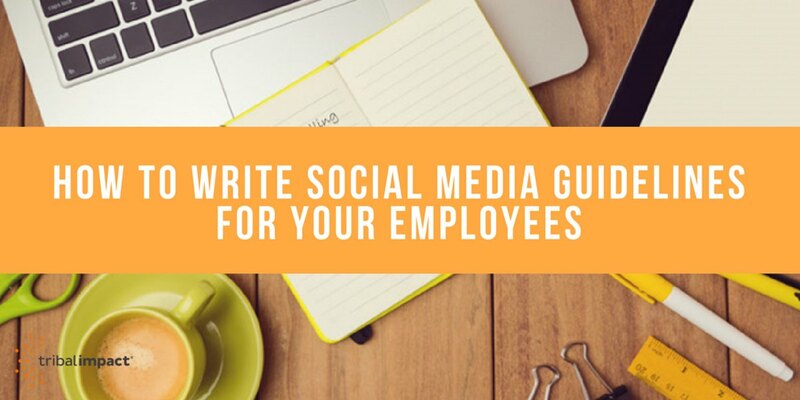 The guidelines should also remind employees of their day job and how time-consuming social media can become. Advise them to keep usage within reasonable timeframes.